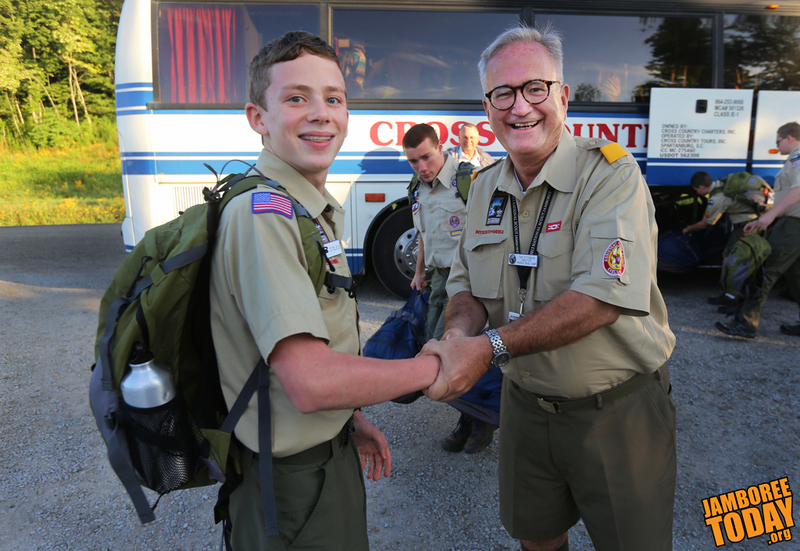 First Class Scout Vance Stiles (left) was welcomed as the first Scout at the 2013 National Scout Jamboree. BSA photo by Ron Kuenstler. Stiles, of Black Mountain, N.C., says his activities and destinations included 9-mm pistol and .22-caliber rifle shooting, riding the BMX tracks, walking the CONSOL Energy Bridge and visiting the Sustainability Treehouse "a couple of times. He said he enjoyed firing a 9-mm pistol rather than a .22 rifle because, even though the 9 mm has a small kick, it is easier to control. As for Monday night's fireworks spectacular: "Those were nice. That was definitely on a par with, if not a little bit better [than Disney World]," he says. Unlike some other participants, Stiles was stoic about the frequent rain and mushy mud at the Summit Bechtel Reserve. "The rain nicely cooled us off, but it has not done well to our campsite," Stiles say, where straw was spread over puddles and black mud before the troop packed up this morning. Overall, Stiles says, "The weather was fine." As long as people "manage the mud, it's fine." What would he say to Scouts in his troop who didn't attend the jamboree? Moreover, would he return? "I'm going to tell them they should have come," Stiles says, "and ... we should come back as a troop." He added he would be interested in returning to experience a high adventure camp, 10 weeks of which are scheduled at the Summit in 2014. In remarks unsolicited by Jamboree Today, Stiles thanked jamboree staff. "The staff here has been wonderful," he said. "The work people put in has made this a great jamboree." Once Stiles leaves, he'll be able to snooze on the bus home. Even so, Stiles said, people camping don't require as much sleep. "You've got the camping adrenaline," he said. "But yeah, I'll sleep when I get home." Stiles is also looking forward to a hot shower and "real food," such as stir-fried chicken. "My mom makes it; it's really good," he said.